The latest podcast of Evolution 101 deals with Darwin's Deadly Legacy's claims. Did someone say Ann Coulter would be a guest?! I don't think she will be as of now. I'd totally love it, but I don't think so. I think he (was it Perry who said it?) was referring to that Ann Coulter would be a guest on the show that they were discussing (the documentary claiming that Darwin led to Hitler). Use your computer's idle time for cancer research. Regarding the leaky tree - imagine if the roots had reached a sewer line rather than water main! An accepted and adopted belief system might just be right down dangerous as in this case of the water leaking from a tree and some people drinking that water thinking that it is miricle water just because they accept the idea that physics can explain it without bringing in something that may not exist and is not closeto being understood such as God. From Southpark "Simpsons did it, Simpsons did it!!!" 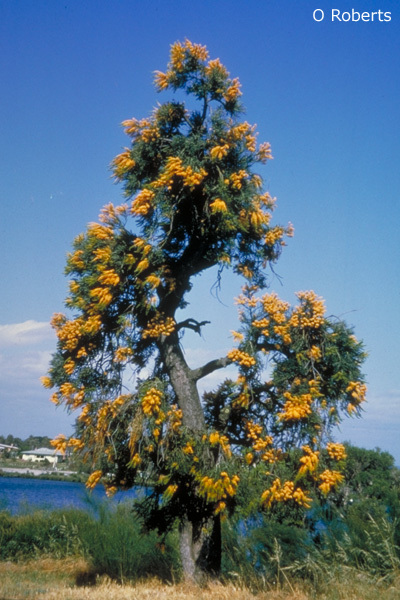 There's a tree in Western Australia description photo which, as a parasitic plant has roots which work like a pincer to tap into its host's roots. The local telephone company has had to re-route the underground telephone cables to more than 150 metres away from any of these trees to stop it damaging the cables. If you follow that logic then the creationist are in the camp of Hitler. Funny, in Mein Kampf god is written over 50 times.